Here's number 2 on my personal 'the best books about Elizabeth I' list (number one being J.E. Neale's timeless publication). Called Elizabeth I (not too original, I admit...), Anne Somerset's biography is the most detailed account of Her Majesty's life that I've come across so far. The very size of the book is pretty intimidating - more than 700 pages - but don't let that scare you off. The story is well written, so before you notice you'll be halfway through the brick-like volume. 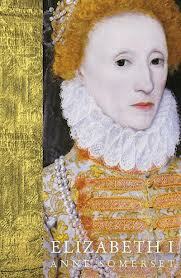 Elizabeth I follows the queen's life from cradle to grave. Somerset is fairly conservative in her version of history. All the main events are described, political twists and turns demystified, major players at court presented and analysed. While there are no surprises or groundbreaking discoveries, the 'usual stuff' is covered competently and in detail. Somerset makes good use of sources available and although she sometimes presumes to know the queen's very mind (a capital crime in a historian), her account is overall well-balanced and convincing. Happily, the author knows that life (even royal life) is not all about politics - substantial sections of the book are given over to the study of Elizabeth's wardrobe, household and leisure activities. I'm usually as far from a fashionista as it is possible to be, but I found description of Her Majesty's dresses and jewellery quite fascinating. Elizabeth may have claimed to have a heart of a king but she was first and foremost a woman. The hunt for more books about the famous queen is still on.